PROPERTIES LOCATED NEAR HAPPY CAMP, CALIFORNIA: We now have access to 60 miles of gold properties near our Happy Camp facility. Approximately half of this region’s property is located on the Klamath, Salmon and Scott Rivers (in northern California near the Oregon border). About half is on the creek and tributaries to these rivers, not far from the small, but friendly, full-service town of Happy Camp. Siskiyou County, where our Happy Camp headquarters is located, is one of the highest gold-producing counties in California’s golden history. However, because this area is several hundred miles away from the famous, but congested, Mother Lode area or any large cities, it has not been heavily worked by modern gold mining activity. The opportunity for successful prospecting is excellent. 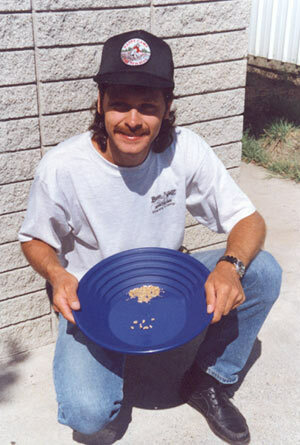 During the past twenty summer mining seasons, literally hundreds of thousands of dollars in gold-value has been recovered by small-scale gold prospectors (mostly New 49’er members) from the Happy Camp vicinity. New gold strikes are being made on a continuous basis. Because of our abundant property reserves, the surface has barely been scratched. Most of these available mineral properties have yet to be seriously tested or mined by our members, and we are adding more proven mining properties on a routine basis. Our policy provides for growth: It is better to have more than enough mining properties and have them set aside for the future of our members! Getting to Happy Camp is a bit of a drive for some people, but we feel it is far better for members to spend a few extra hours on the road to get to a proven gold-producing area, rather than to spend an entire vacation prospecting somewhere else and not recover any gold!